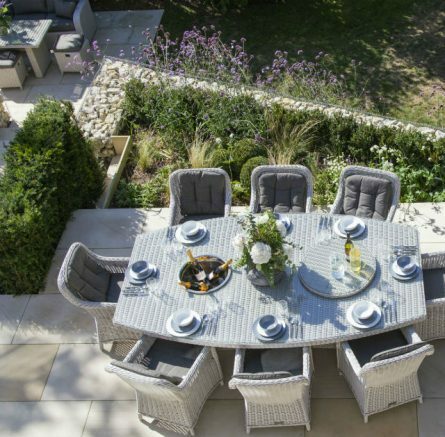 Formerly an 18th century nursing home converted into a modern family home. 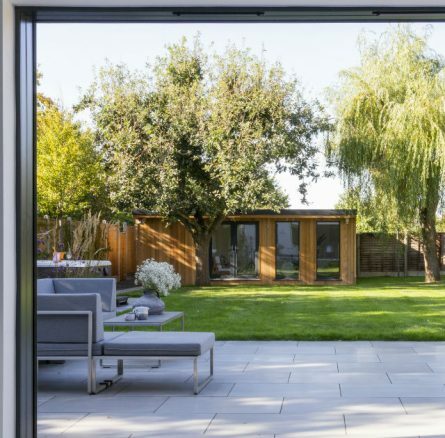 Being on a corner plot, the garden wraps around one side of the house which creates an L shape; this was divided into 2 areas, the ‘Contemporary Living Courtyard’ and ‘English Blue’ side garden. 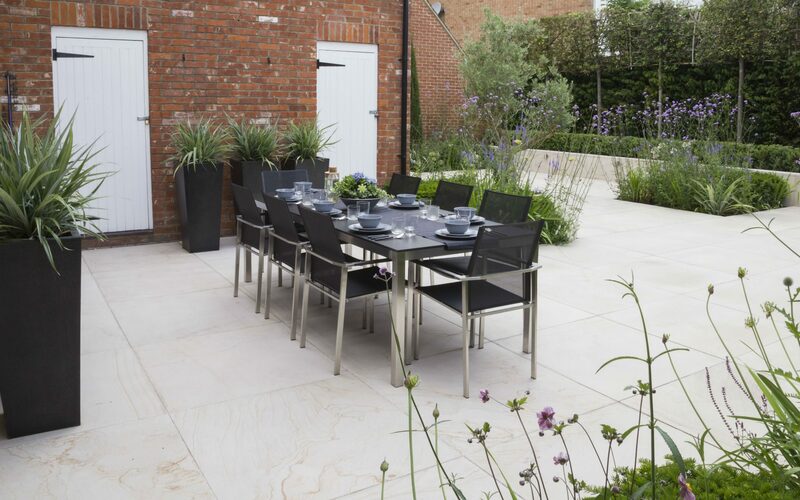 The courtyard was paved entirely with Stonemarket Colossus stone and due to it’s size we were able to choose 1000mm x 1000mm slabs. The designs geometry was also divided into 1000mm blocks so that everything lined up, creating a real sense of space. 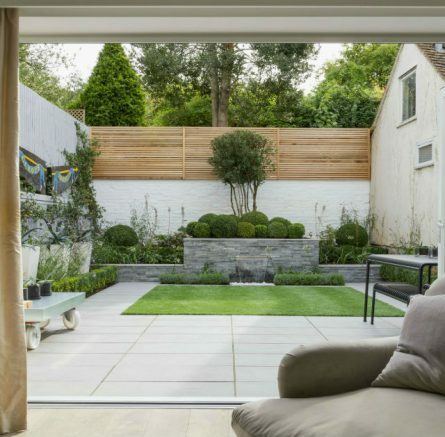 The hard boundaries were softened with an instant Yew Hedge and 9 pleached Quercus Ilex which hid the neighbour’s Leylandii. The gable end of the garage was softened with 2 Italian Cypress. 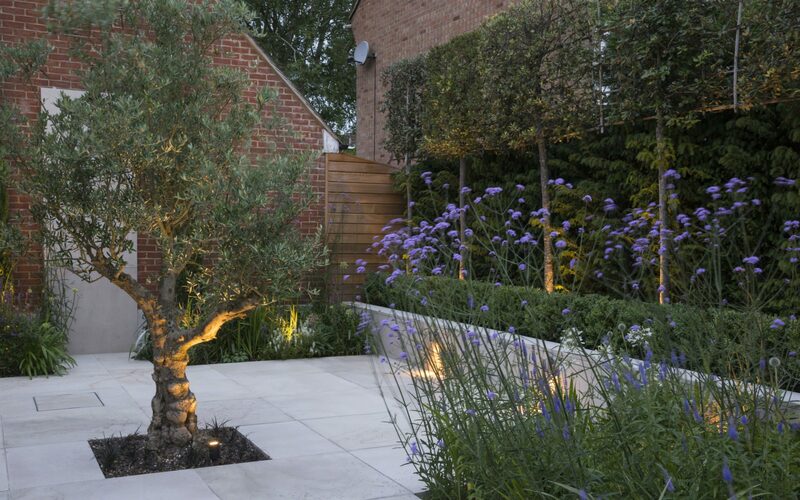 An existing olive tree was taken from it’s container and planted to give a well balanced focal point. The remaining areas were planted with a combination of clipped Taxus and Buxus for year round structure and evergreen to complement the yew boundary, and a subtle palette of perennials for year round colour. A simplified automated irrigation system was installed to keep everything looking great. 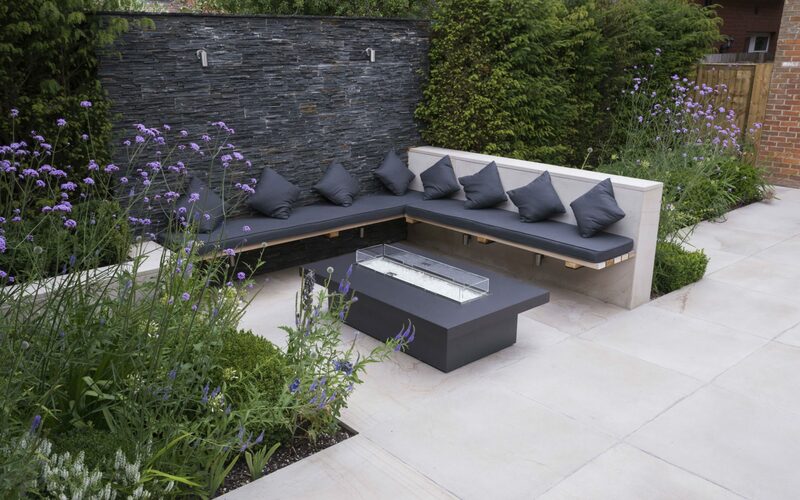 A feature, textured tier walling system created a backdrop to the bespoke seating area which was centred around a 2m Rivelin Firetable with an integrated LED Lighting system. 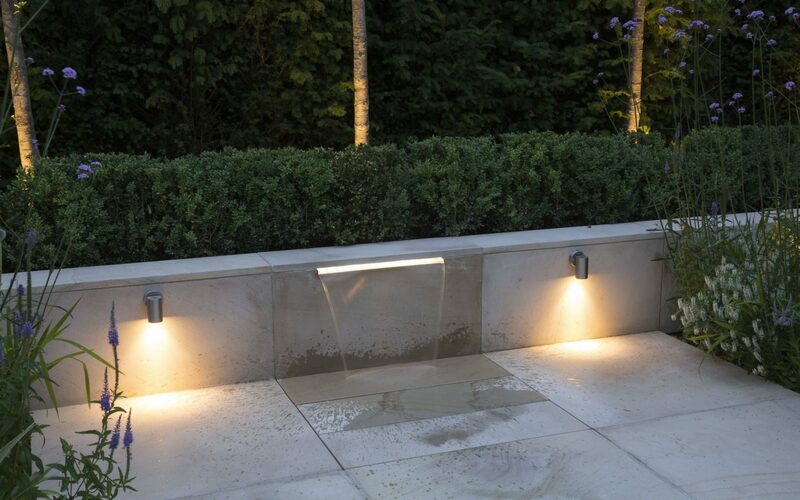 A bespoke water feature was created for movement and sound and Lighting played a key feature adding ambience in the evenings. 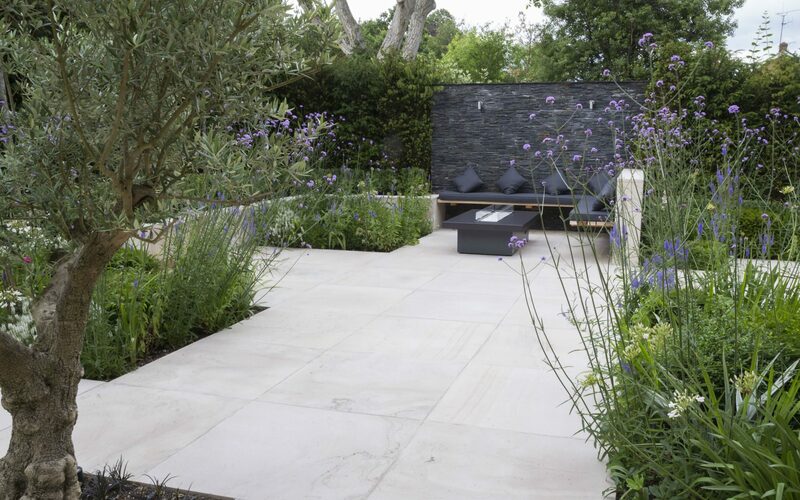 The side garden was designed to give privacy from the overlooking house and to hide the driveway from within the garden. 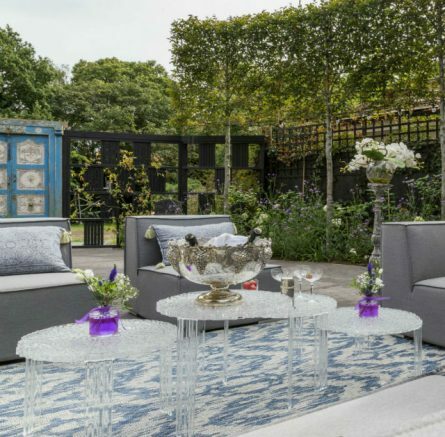 12 Magnolia Grandiflora were used to create a mature screen and balanced out both gardens. 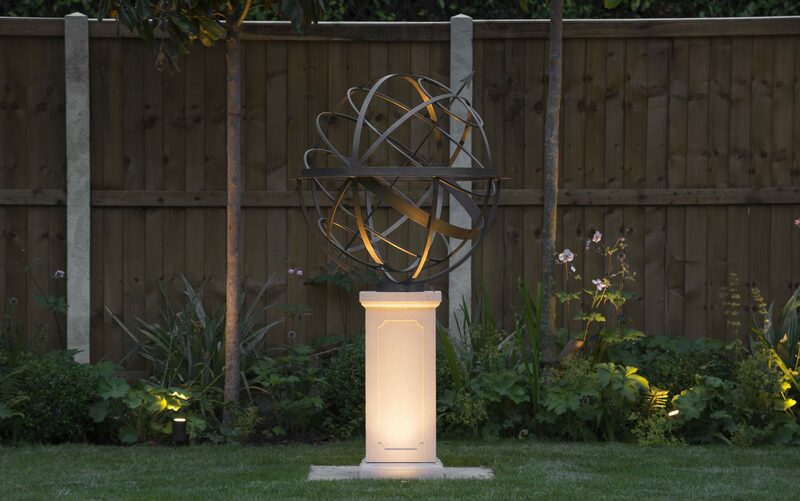 A main focal point was a bespoke commissioned David Harber sundial which was personalised by the family with inscriptions.